The Hentenna is an Asymmetrical Double Rectangle (ADR) Loop Antenna originally designed by Japanese Hams operating on the 6 m Band in the 1970's. They discovered the antenna exhibited good performance. It was however difficult to explain why the performance was so good and how it worked. Based on this and several other unusual properties of the antenna they named it "Hentenna." In Japanese "hen" means "strange." Another strange characteristic of the Hentanna is that if it is mounted horizontally, the resulting RF field is vertically polarized and vice versa. When it comes to overall performance it compares in some ways to a 2 to 3 element Yagi-uda antenna. The Hentenna produces a bi-directional beam (at right-angles to the plane of the antenna) with a reported gain of between 3 and 3.5 dBd at a low take-off/elevation angle of approximately 13 degrees which makes the hentenna a great DX antenna. Actual gain and take-off/elevation angle is influenced by especially ground type underneath the antenna and antenna height above ground. I opted to mount my Hentenna horizontally to produce vertically polarized signals, as most local stations are using vertical antennas. For DX purposes, signal polarization can be either vertical or horizontal, the choice to mount the antenna vertically or horizontally is yours. Mounting the antenna horizontally also has the added advantage that the antenna mast required is significantly shorter. The Hentenna is a bi-directional antenna and its radiation pattern (indicated in figure 1) consists of two lobes. The horizontal beam width at the -3 dB points is approximately 77 degrees and the vertical beam width at the -3 dB points is approximately 21 degrees so it is important to "point" the broadside of the antenna in the direction of interest. "VOACAP HF Propagation Prediction and Ionospheric Communications Analysis" is a very useful online tool to determine bearings of areas of interest: http://www.voacap.com/, specifically the "Point-to-Point Predictions." It is important to note that True North and Magnetic North are not the same and differ significantly in different parts of the world. Look up the difference for your area and compensate for the difference when "pointing" your antenna using a compass. 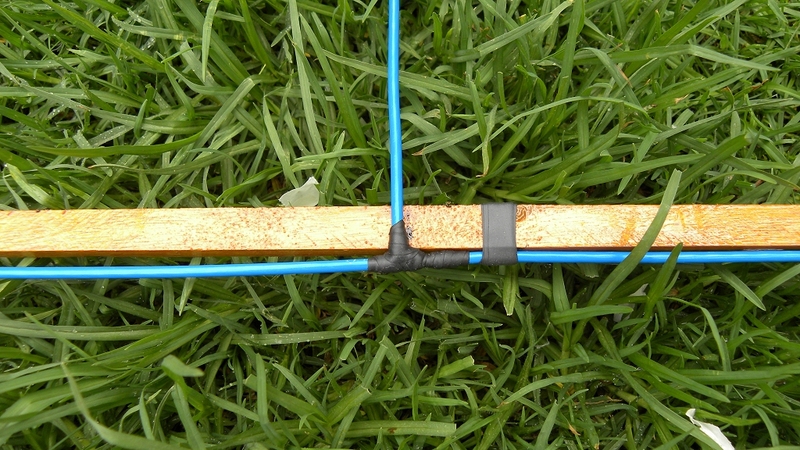 To rotate the antenna, I use the "arm-strong" method; I tied a length of gut line to the side of the antenna so that it can be pulled. 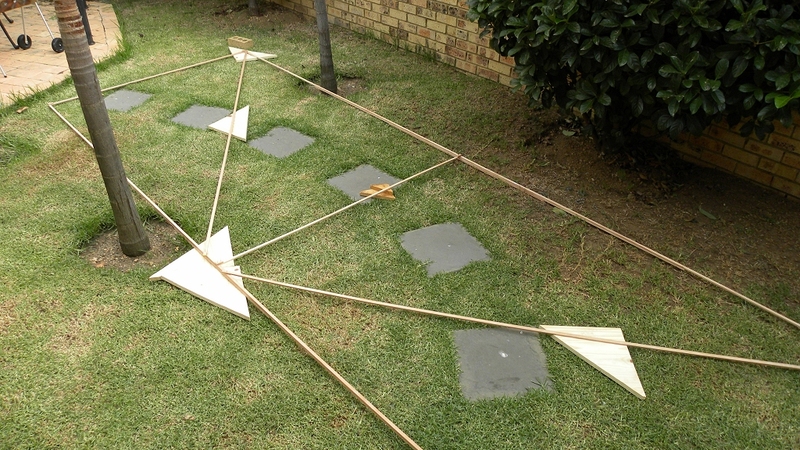 As the antenna is bi-directional the turning radius required is only 180 degrees. Visit "Wikihow" for different methods to find True North: http://www.wikihow.com/Find-True-North-Without-a-Compass. 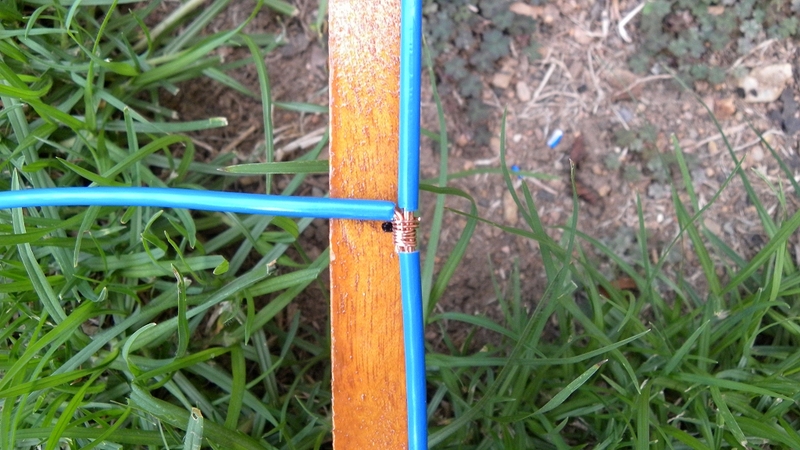 For this design I used standard PVC insulated electrical copper wire. 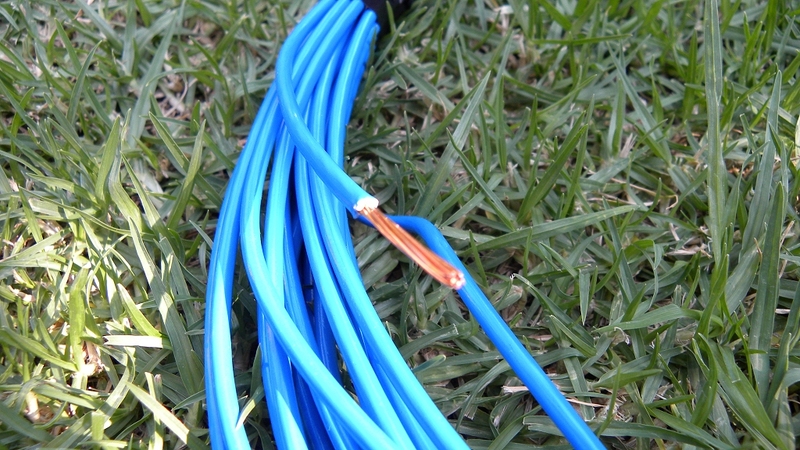 With respect to RF, the PVC insulation causes the wire to appear longer than it really is, this is caused by a phenomenon called "velocity factor." This has been taken into account and the dimensions I use here have been decreased by 6 % (factor: 0.94) which is the velocity factor of standard PVC insulated electrical copper wire. 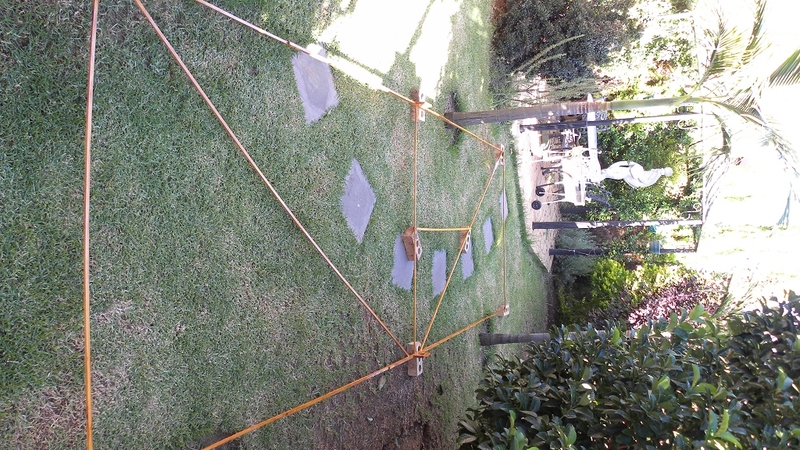 Feed-point from the side of antenna: wavelength / 6: 10.234 / 6 = 1.706 m (this may vary between 1.023 m and 1.706 m depending on surroundings and ground type, use trial-and-error to find the ideal feed-point for your antenna; you may consider starting at 1.365 meters from the side of the antenna). The measured band width of this Hentenna is 915 kHz at the 1:1.5 VSWR points. I measured the VSWR of the antenna and found it to be less than 1:1.2 at 27.500 MHz and 1:1.5 at 27.045 MHz and 27.960 MHz respectively (refer to figure 3). To adjust/tune the VSWR move the feed-point left or right. Both feeding wires need to be at the same distance to the side of the antenna, so they need to be moved left and right together. Once the ideal point is reached, solder the two wire connections in place. To make the connections waterproof tightly wrap them with self-amalgamating tape. Do the same for two coax connection points. Running this design in EZNEC produces VSWR and Radiation Pattern plots as indicated in figures 4, 5 and 6 respectively. 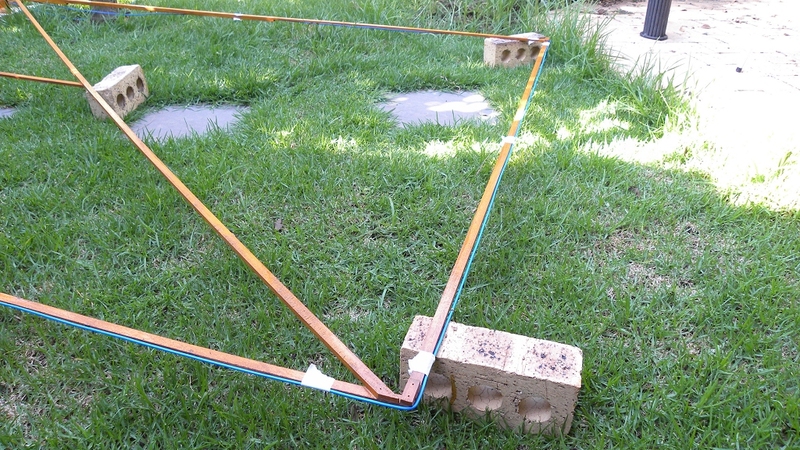 I selected sandy, dry ground (the antenna is mounted over a house built with concrete and bricks) and PVC insulated copper wire with insulation 0.6 mm thick in the simulation. 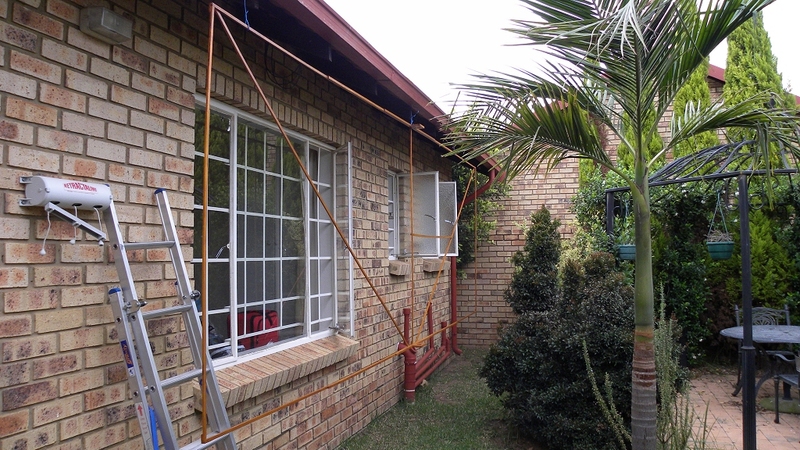 The antenna was placed 5.5 m above the ground. The results indicate that the theoretical VSWR and the VSWR I measured are very similar and the antenna gain at 13 degree take-off angle is 4.31 dBi (2.2 dBd, i.e. 2.2 dB gain over a dipole mounted at the same height). Figure 7 shows the EZNEC antenna model and current distribution curves. The Hentenna is relatively easy to construct using Meranti wood and standard PVC insulated electrical copper wire (refer to figure 2). 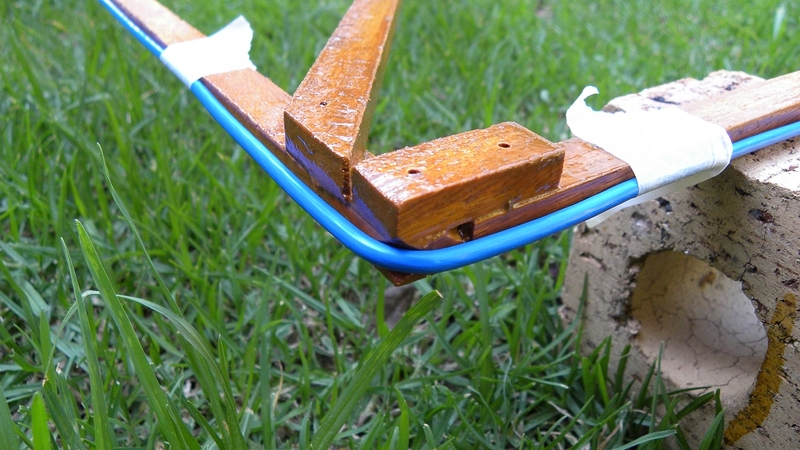 Meranti wood is light and has a long grain which makes it ideal for use as the antenna frame. 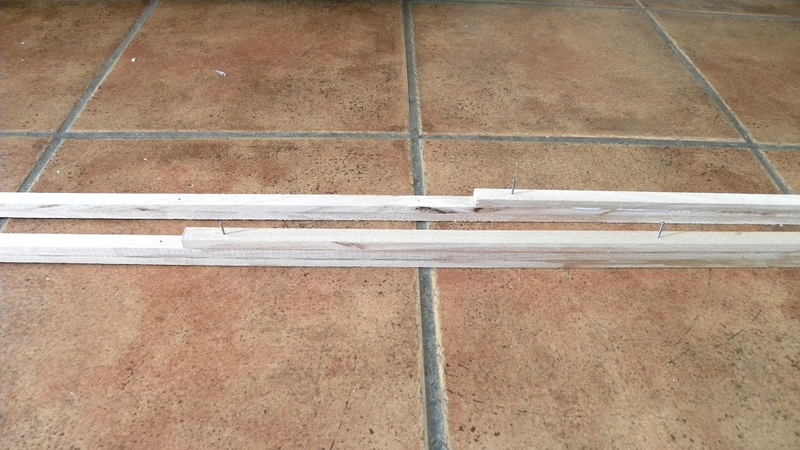 Due to its long grain it will withstand bending in the wind without snapping allot better than other wood types. To strengthen the top and bottom sections of the antenna I laminated the sections by gluing two additional shorter lengths to each section. It looks almost like a laminated carriage/leaf spring. Furthermore, all the wood sections are turned on their side for added strength. 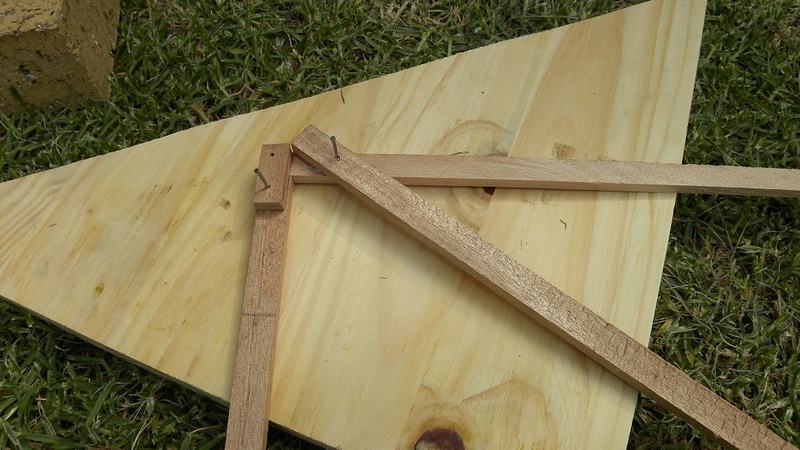 Apply wood glue and temporarily nail/screw the sections in place. Remove the nails/screws once the glue has dried. Leaving the nails/screws may affect the radiation pattern of the antenna. 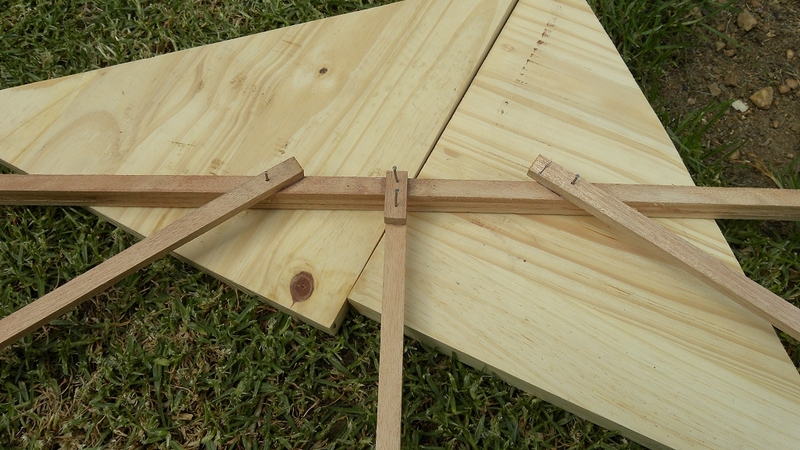 File slots into the four corners of the frame into which the wire will bend. 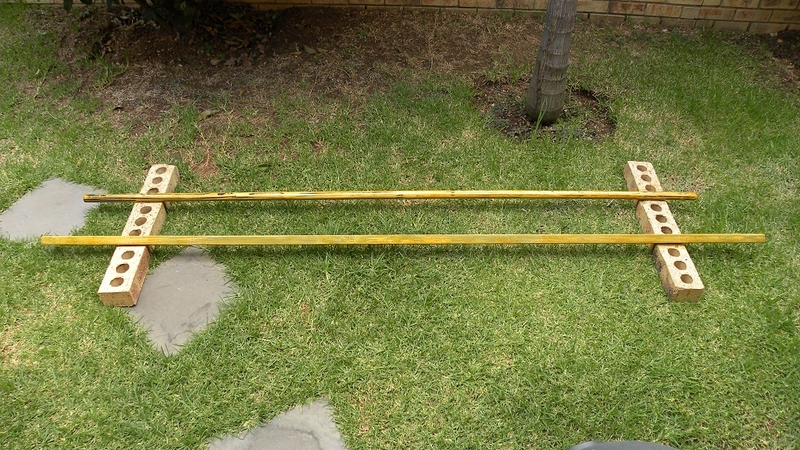 If you have limited space to build and assemble the antenna as I do you might consider making the mast in two sections. 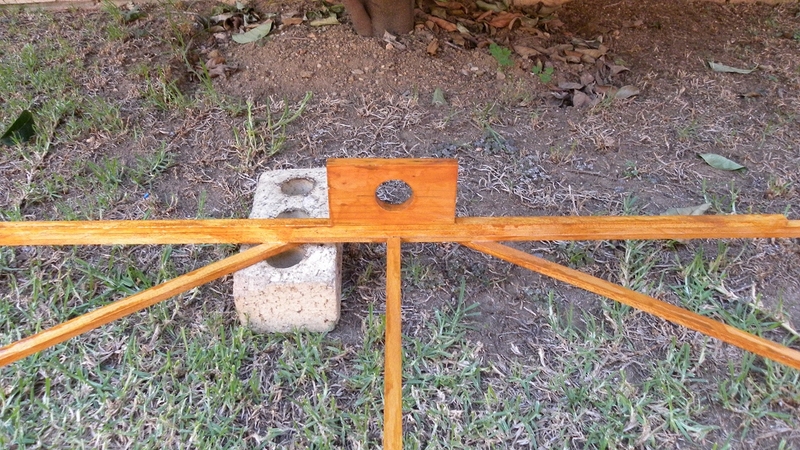 The top section being a round wood dowel to which the antenna is mounted and the bottom section a square wood dowel. 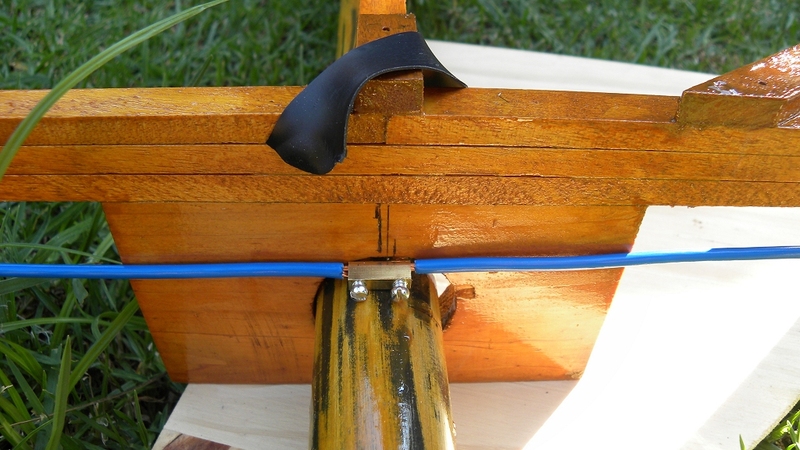 To prevent the antenna from sticking to the mast, turn a few windings of self-amalgamating tape around the mast where the top and bottom antenna mast mounts will be placed. 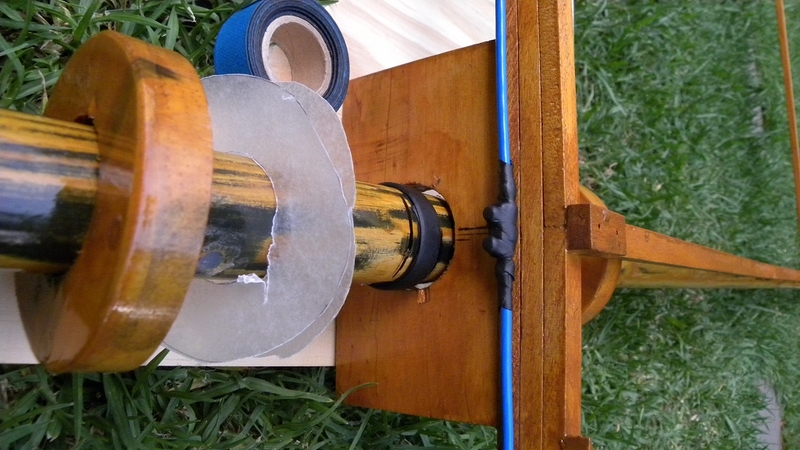 Also insert wax paper between the four rings and the two antenna mast mounts. Push them together and "glue" the four rings in place using Marine Silicone Sealer. Check that the mast mounts are perpendicular to the mast. As a tip, rub dish washing liquid onto your finger so that the silicone sealer does not stick to them. 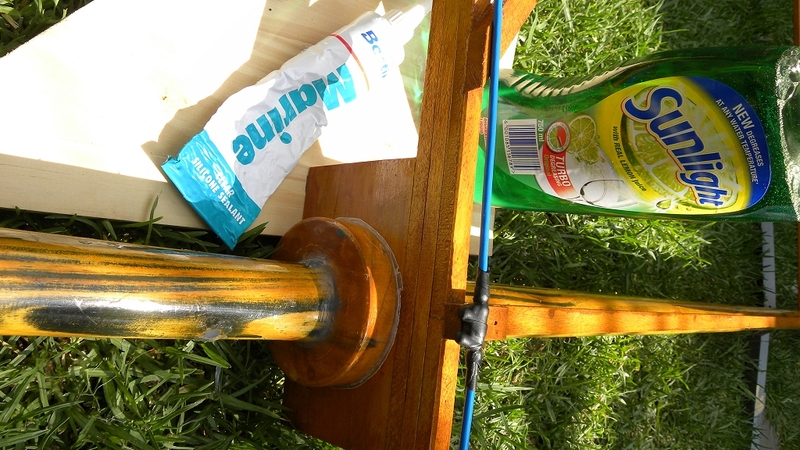 As the antenna and mast is mounted outdoors it is exposed to the elements thus it is important to seal the wood. I used NOVA 14 polyurethane wood sealer paint which contains a water repellent, anti-fungal agent and is UV resistant. 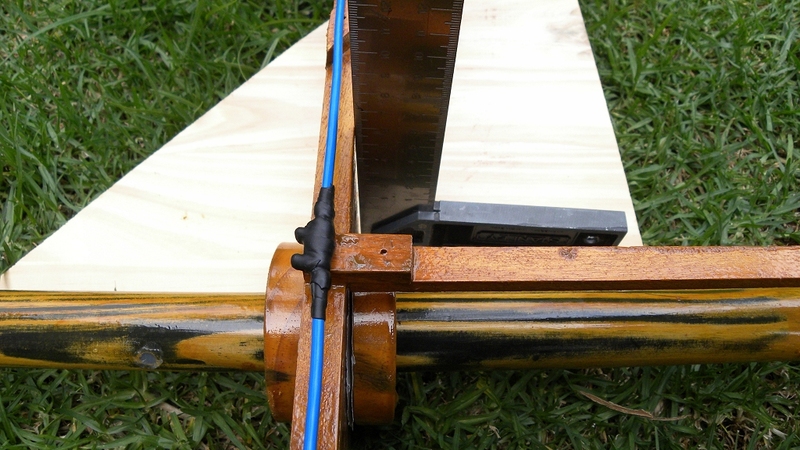 Pull the wire around the wood frame ensuring it is as straight and as taught as possible. Keep in place using cable ties. 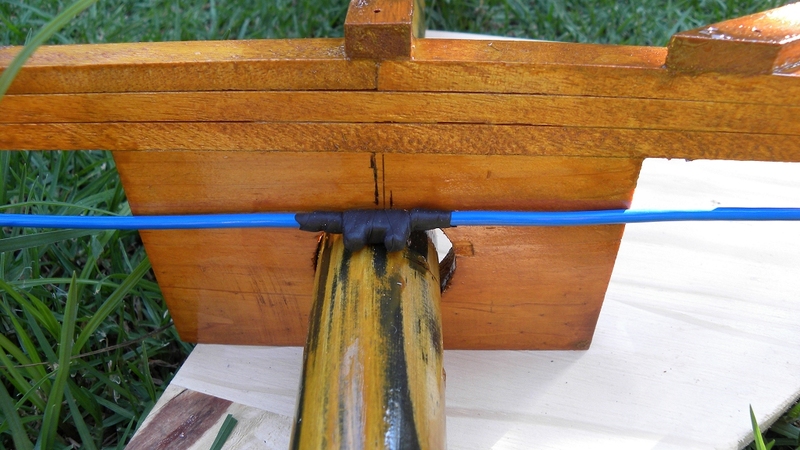 Join the two ends of the wire using a terminal block, sometimes called a "chocolate block." To make the connection waterproof tightly wrap with self-amalgamating tape. Excessive bends in the wire and/or sagging might distort the radiation pattern of the antenna which may affect gain and directivity respectively. 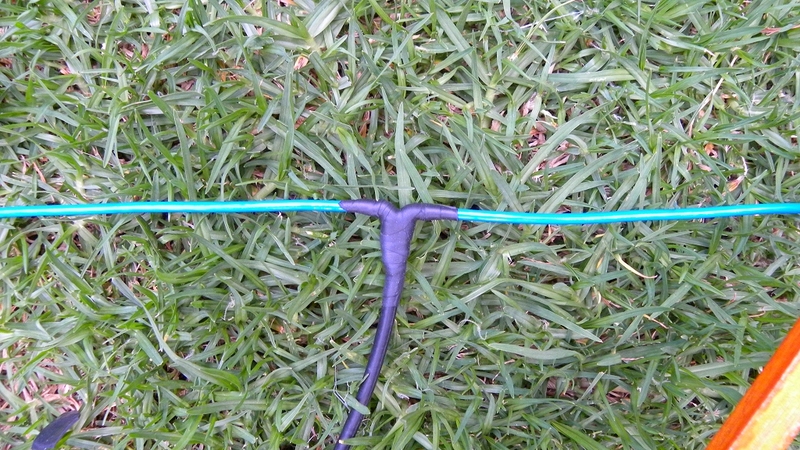 Before connecting the antenna to the RG-58U coax cable transmission line, which is un-balanced, it is necessary to "convert" the balanced characteristics of the antenna to that of the un-balanced transmission line using a Current Balun. The Balun converts the balance to an un-balance; hence the name "bal" for balanced and "un" for un-balanced. Before tuning the antenna, ensure the coax cable transmission line is cut to a length which uses multiples of 0.5 wavelength because each 0.5 wavelength of cable represents the characteristic impedance of 50 ohm. Also take the velocity factor (VF) of the cable into account. The VF for RG-58U Solid Polyethylene (inside insulation: transparent) is 0.66 and for Foam Polyethylene (inside insulation: white) is 0.78 respectively. Solid Polyethylene coax cable one 0.5 wavelength long is 3.600 metres. The calculation (in metres) is as follows: 300 / 27.500 x 0.66 / 2 = 3.600 m. This length does not include the extra coax cable required for the Balun, it is only the length of the coax cable transmission line from the Balun to the receiver or transceiver. Whether or not this is beneficial is a controversial subject, some say it is better to follow this procedure whereas others suggest it is not. 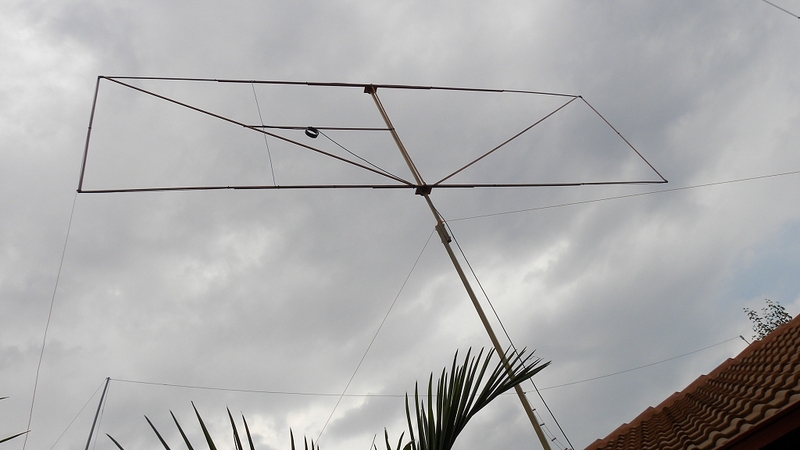 If you have the space why not try building a Hentenna, it's a classic antenna and it works well. As with most antennas, try to install the antenna as far away as possible from surfaces and objects that reflect RF.